Since I created the image for this post it has become more 'Things that are now in my wardrobe', as my mum treated me to the skirt, the dress and the backpack as a reward for my AS results (yaaaayy). The faux snakeskin backpack will be my new college bag and I loved styling it up with the maxi skirt, a black crop top and vampy lipstick for a grungy A/W look. Personally I think Topshop is killing it at the moment, as more and more highstreet shops begin to trickle in pieces from their A/W ranges; it seems that every time they update their 'New in' page (I check everyday) there's at least 4 pieces I cannot live without...goodbye bank balance, hello A/W wardrobe! THEY ARE £13.50...WITH FREE POSTAGE...say whuuuttt?! Plus, they're not just an absolute bargain, but in my opinion a much better shape than the Vapors themselves, to me the Unif originals seem a bit corrective and almost like they've been drawn by a small child - it can't just be me? Let me know what you think of these picks! otherwise im totally for maxiskirts! 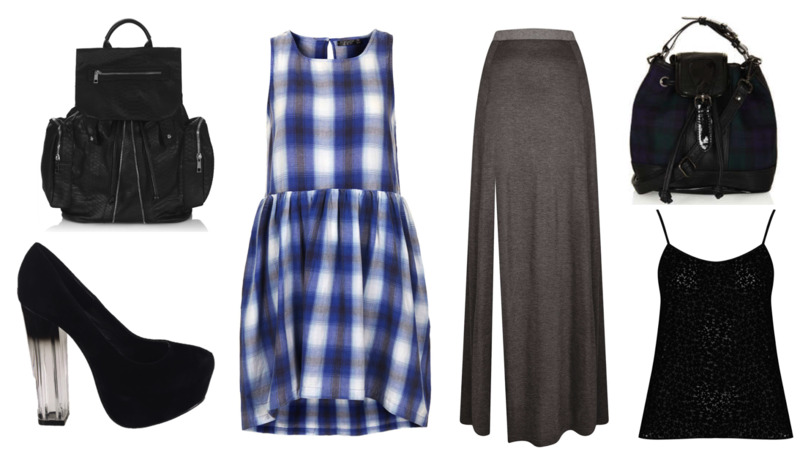 I love everything- especially the plaid dress!